Quiz & Learn Python - Learn Python on Your Mobile! Quiz & Learn Python is an iOS, Android, and Firefox OS app for testing and improving your knowledge of Python concepts! Questions range from basics of programming to highly Python specific, possibly unexpected ways to write your code. Whether you are a Python novice or an experienced Python coder, there will be challenging questions for you. Some of the questions are about the very basics of Python. They get harder as you progress. In the end, they can be about the quirks of the language. The faster you answer the more points you gain. So think fast! Like in any good quiz game, you have lifelines to help you on your way to Python proficiency. Use them wisely, as you can only use them once per game. 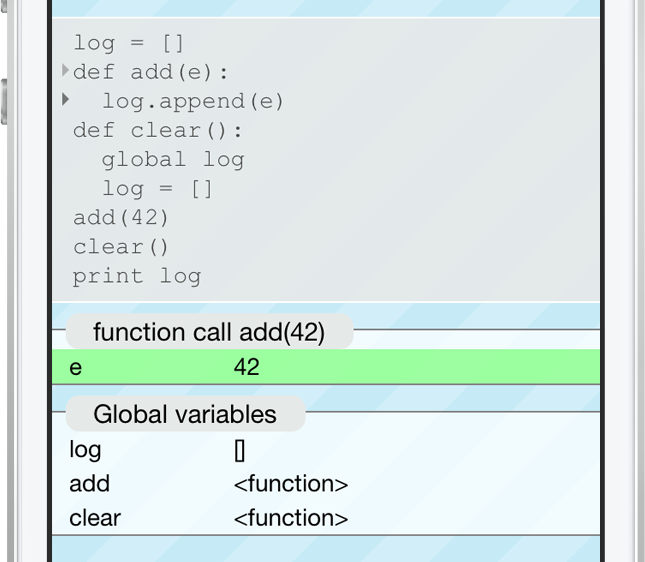 The debug lifeline (which I seriously suggest you use) lets you step through the code line by line, backward and forward, and see all function calls and variable value changes. Get the app from your favourite store below! It's only $1.99 on iOS and free on Android and Firefox OS.